(Photo: Peter Williams/WCC)Jerusalem skyline showing al-Aqsa Mosque. Church leaders in Jerusalem are for sake of peace calling to maintain the historical status quo on the historical designation allowing access to al-Aqsa Mosque and its courtyard, as well as other Holy Sites in the city. In an open letter, patriarchs and heads of local churches in Jerusalem, expressed concerns over change in the Historical Status Quo of Holy Sites after recent violence and developments around the mosque. "Any threat to its continuity and integrity could easily lead to serious and unpredictable consequences which would be most unwelcome in the present tense religious climate," the letter reads. The measure came after three Arab-Israelis shot dead two Israel Police officers just outside the compound on July 14 Friday, weapons smuggled into the religious site. After a gun battle in the mosque compound, Israeli police closed and cancelled Friday noon prayers at the mosque, marking the first time in decades for such a closure. The church leaders called for continued free access to pray, particularly for thousands who pray there every Friday, the World Council of Churches said in a statement on July 20. WCC acting general secretary Father Ioan Sauca, who is also a deputy general secretary of the WCC and director of the Ecumenical Institute at Bossey, urged the world church body to unite in prayer for a just and peaceful solution in Jerusalem. 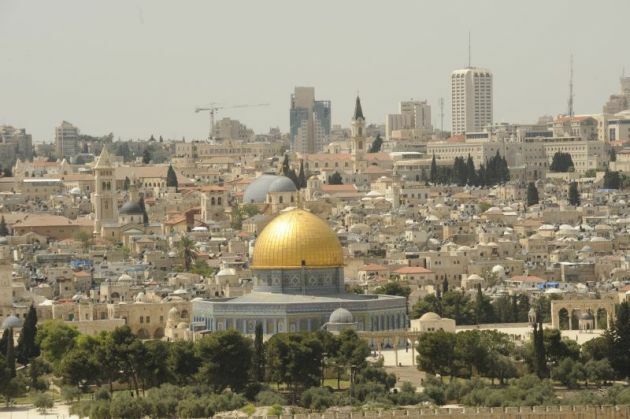 "Keeping the historical status quo and supporting equal rights for Christians, Muslims and Jews at these holy sites is vitally important to maintaining peace and de-escalating violence," said Sauca. "Denying access to holy sites for thousands of people who have travelled far to pray is not only a violation of the rights of those individuals, but also a corrosive act in the midst of an already-fragile peace." Sauca urged a just and peaceful solution to the situation before noon on Friday, when thousands will travel to the al-Aqsa Mosque to pray. "We stand in solidarity with Muslims, Jews and Christians, and we pray that justice and peace will prevail, not only this week but in weeks and months to come." The Times of Israel Middle East analyst, Avi Issacharoff, wrote July 20 in the newspaper that the decision to set up comprehensive security inspections and walk-through metal detectors at the entrances to the Temple Mount "may well seem reasonable and justified, in light of the deadly terror attack last Friday near the compound." "But any attempt to apply 'justice' or 'reason' to the holy site is irrelevant, and the measure has brought on a rare consensus of resistance among the Palestinians, as well as in the Arab and Muslim world." He reported, however, a solution may be at hand. "According to the reported proposal, the walk-through detectors will be removed and selective screening will be held for worshipers deemed suspicious — with police using handheld wands similar to those used at the entrances to some Israeli shopping malls."